ATTA Members should follow this link, and support the Adventure Travel Conservation Fund. The Adventure Junky App has turned travel into a game. For each adventure you complete you earn points and move up the Leaderboard. You can play against your friends for bragging rights, or play against the world, for the title of the ‘Earth’s Number 1 Adventure Junky”. The Adventure Junky App can generate high quality leads for you organsation. Adventure Junky uses gamification to incentivise its growing, global community of adventure travelers to achieve their travel goals - the same way FitBit does for fitness, and Strava does for cycling. Tour Operators, Destination marketers and Accomodation providers can access this highly-engaged audience with an Adventure Junky Partnership Package. Partnership pricing is scheduled to rise in Q1, 2019 ahead of our marketing push. Adventure Junky is currently seeking a limited number of Partners at the current 'low barrier' price to grow our adventure inventory and cater for the anticipated user growth. Destination Marketing Partners are featured on the Dream Feed (App home screen) with a dedicated, branded panel that provides a direct link to all of that destination’s adventures. From the Dream Feed, or via a search, users can view all Adventures in a particular destination. Each of your adventures (tours, attractions, etc) have their own listing, featuring an image gallery, map and description, plus a string of other features. You can choose where your Adventures link to, it might be your own website, a booking page, an operator’s site, or a Social Media site. The choice is yours, and there’s virtually no limit to the links you can make, if they are relevant to the Adventure. Link your Adventures to your website, or any other external pages. Your presence on the Adventure Junky App as a partner is not limited to your Adventures. We regularly feature Partner video content on our Dream Feed (opening app screen) and are happy to coordinate with your campaign activity. Our Destination Leaderboard tracks the most ‘adventurous’ destinations. Results are based on the number of adventures listed on the app, and what our users are searching for - so as a Destination Marketer it pays to list as many adventures as you can that meet our Guidelines. Destinations, Activities, keywords, Patches and users are all searchable on the Adventure Junky App. We make is super easy for our community to find your Adventures. Fancy an adventure fix? Well fortunately it’s easy to find your nearest adventure, whether you are home or abroad. Tour Operator Marketing Partners are featured on the Dream Feed (App home screen) with a dedicated, branded panel that provides a direct link to all of that Tour Operator’s adventures. What are Partnership Packages and how do they work? 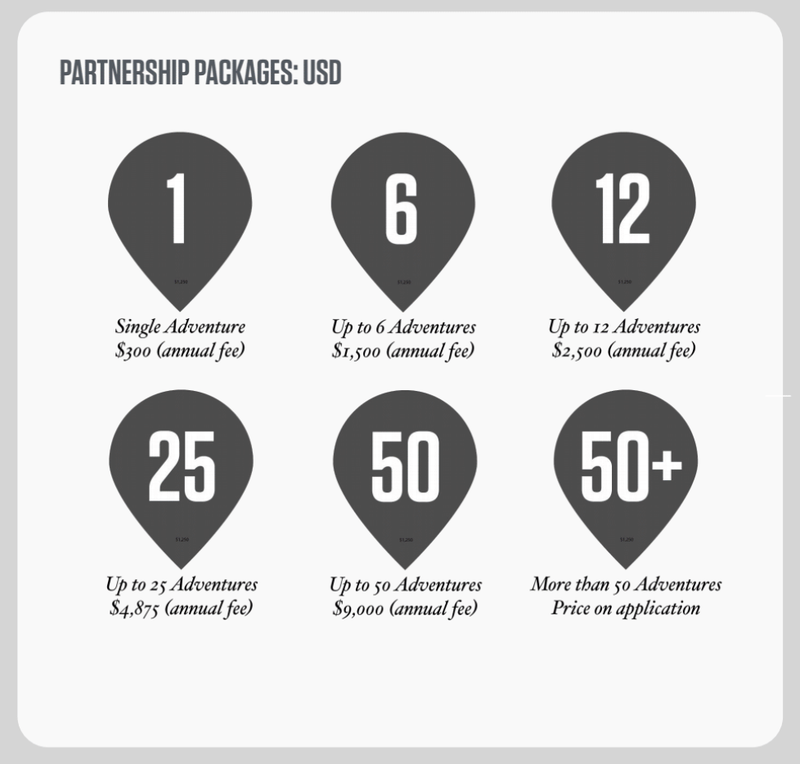 Partnership Packages are our way of showcasing your adventures (trips/tours/attractions) on the Adventure Junky App. The way they work is simple - you buy a package that suits your business/organisation and the number of adventures you'd like to list on the App. You can list a single adventure or up to 6, 12, 25 or 50 adventures in a Package. Fill your trips, showcase your adventure credentials. Need more information before you purchase a Partnership package? Book in a conversation to learn more and answer any questions you may have.